An international seminar celebrated and reflected on the progress made in improving wellbeing in Northern Ireland. In the year of the 20th anniversary of the Good Friday Agreement, it is an appropriate time to explore the wellbeing of Northern Ireland’s citizens, and the work being undertaken for future generations across all communities. 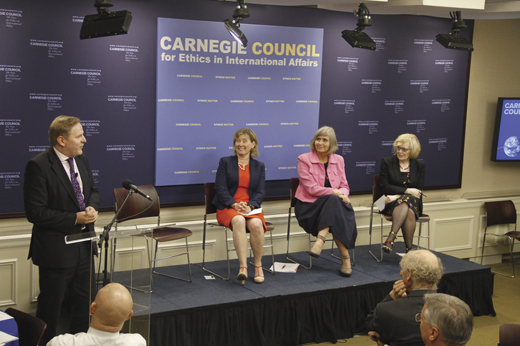 And on this past October 8, the Carnegie UK Trust hosted an international seminar on wellbeing in Northern Ireland in New York, in partnership with fellow Carnegie institution the Carnegie Council for Ethics in International Affairs. The event featured an address by former United States senator George John Mitchell, who reflected on the role that America played in the Good Friday Agreement; the views of Democratic Unionist Party representative Peter Weir MLA and Sinn Féin representative Máirtín Ó Muilleoir MLA on the current situation in Northern Ireland; and the contributions of senior stakeholders in Northern Ireland on the remaining challenges and aspirations for the future. The audience consisted of American policymakers, analysts, and other key stakeholders with an interest in learning from those with direct experience in improving wellbeing in Northern Ireland. Following the conference, the Northern Ireland Bureau co-hosted a networking reception for delegates and key opinion leaders with the support of the British Consulate, highlighting how the Northern Ireland framework can be used as a model for future projects.